Griffin nylon bead cord in size #4 is a great alternative to its silk counterpart. 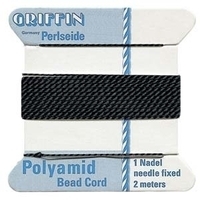 This nylon is extra strong and stretch resistant, making this a durable thread to use for bead stringing and knotting. There is no simpler, quicker, or better way to thread beads. 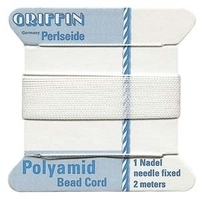 The twisted stainless steel needle at the end of the cord saves threading time. You can knot the cord easily because the thread has the correct twist. Each card holds approximately 79 inches of thread, which is roughly two meters.